Among the students from Bibb County high schools piling up college credit at Middle Georgia State before graduating from high school are Desmond Talton, Kaitlyn Johnson, and Kristen Cohen. All three take courses at the Macon Campus. Photo by Maryann Bates. It's not as though Desmond Talton didn't have enough to keep him busy. In addition to his classes at Macon's Westside High School, where he is a senior, Talton participates in the Beta Club and Technology Student Association. He also plays right offensive guard for the Seminoles. In the fall, football practice consumes his weekday afternoons. Yet the 17-year-old decided to take on even more when he became a dual-enrollment student at Middle Georgia State University. "When I heard about dual enrollment I just couldn't see myself turning it down," said Talton, an aspiring engineer who is taking psychology and college algebra at the Macon Campus this semester. "It's a way to get started earning college credits, and it looks good on your record." Middle Georgia State (MGA) is a popular choice for students such as Talton who want to start college before they've graduated from high school. In the last two years, the number of dually enrolled students at MGA has ranked in the top seven of University System of Georgia schools. This fall, nearly 530 high school students are taking classes for college credit at Middle Georgia State. About 50 of those are residential students at the Cochran Campus-based Georgia Academy, an exclusive two-year program that allows participants to simultaneously earn high school diplomas and associate's degrees. Most, like Talton, commute to one of MGA's five campuses or take courses online. Some take a class or two at Middle Georgia State to supplement what they're taking in high school; others are enrolled full-time in University courses. Some MGA faculty teach college courses on site at various high schools. In a special case, about 20 Hawkinsville High School students ride a bus to the Cochran Campus four times a week. Hawkinsville is among the high schools in Georgia that applied for and received a state grant to pay for bus transportation for dually enrolled students. "Dual enrollment is something Middle Georgia State excels at as far as making it accessible for high school students in a wide area," said Maggie Schuyler, assistant director in MGA's Office of Admissions. "Our five campuses are spread out all over the region, and we offer a wide variety of classes that high school students can take. Many take core curriculum that meets their high school graduation requirements but some have already started with classes that will count toward their intended college major, like information technology and business." What makes dual enrollment such a jaw-dropping good deal is that it's practically free. Through the Georgia Student Finance Commission, the dual-enrollment program (known until recently as Move On When Ready) covers tuition, textbooks, and nearly all fees. The program initially funded fall and spring semesters only but recently expanded to pay for eligible high school students to take college courses during summer semesters. All of which means that dual-enrollment students can knock out the first two years of college nearly for free if they get started early enough. No wonder dual enrollment is as popular among parents - perhaps more so - as it is for motivated students. "My mom strongly encouraged me to get into dual enrollment because it's free," said Caroline Holland, 15, a Hawkinsville High sophomore taking English 1101 and world civilization with several of her high school classmates on MGA's Cochran Campus. "My brother and sister were in dual enrollment, too, so we already knew how much money we could save." Kristen Cohen, 17, a senior at Rutland High in Macon, keeps a running calculator in her mind of how much she is shaving off the total cost of a four-year degree. "I've seriously saved thousands of dollars by taking dual-enrollment classes," she said. Cohen has already earned 30 college credit hours at MGA and expects to have thirty more by the time she graduates in spring 2018. "I want to be a veterinarian so I've got a lot of school ahead of me, but two years of it will be practically free." Emalyn Gernert, 15, a dually enrolled high school sophomore, said her mother has always encouraged her to work hard in school so she will qualify for college scholarships. "My mom is counting on my academic performance to help me pay for college," said Gernert, one of the Hawkinsville High students who rides the bus to the Cochran Campus. "Dual enrollment is a good start toward making sure I don't have to carry a lot of student loan debt." Aside from their obvious youth, MGA's dual-enrollment students stand out in several ways. All are bright and academically driven, and most demonstrate a level of discipline and motivation nearly equal to that of accomplished adults. "My schoolwork has always been my pride and joy," said Kaitlyn Johnson, 17, a Rutland senior who takes all of her MGA classes with her friend Cohen. "I've always worked hard to stay on top of things." Besides her full-time dual enrollment, Johnson, who is considering a career in graphic design but hasn't settled on a college major, works part-time at Starbucks on Hartley Bridge Road and still participates in Rutland High activities, including the Beta Club. Like Cohen, who works at McAllister's Deli part-time, Johnson will graduate from Rutland in spring 2018 and have about two years of college already completed. The two friends hope to enroll at UGA in fall 2018 and live in the same dorm, if not the same room. "I think Middle Georgia State is preparing us well for UGA," Cohen said. Talton shows up at 8 a.m. every day, Monday through Friday, to study at MGA's Macon Campus library, which he enjoys because it's "quiet and peaceful." On days he has the classes that he still takes at Westside, he'll study until about 11 a.m. before heading to the high school. On days he doesn't have Westside classes, he camps out at the library until he has to leave for 3 p.m. football practice. The discipline is paying off in his consistently good grades, especially in math. Talton hopes to attend Georgia Tech to major in engineering, although he hasn't decided on a specialty. "In order to do well, you have to put yourself on a schedule," he said. "If you do that you should get pretty good results." Talton also spends nearly every Saturday morning at the Macon Campus Recreation & Wellness Center, which he's entitled to use as a dual-enrollment student. He usually plays basketball or video games with friends. "That's my leisure time," he said. Bryce Murkerson, 15, one of the Hawkinsville High sophomores who rides the bus, gets in cardio workouts at the Wellness Center on the Cochran Campus after his dual-enrollment classes are over for the day. He's a member of the high school's cross-country and baseball teams. As yet another student who hopes to attend UGA, Murkerson said he appreciates getting an early taste of college through dual enrollment. "I love the freedom you have taking college classes," he said. 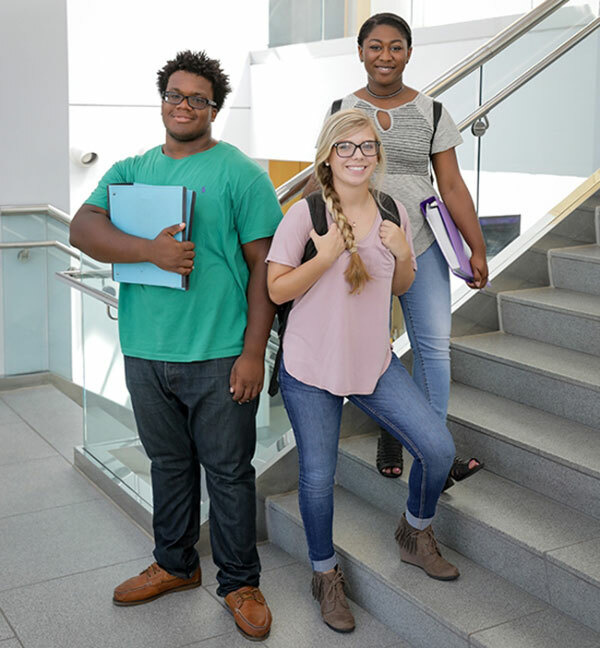 Many dual-enrollment students at MGA also love the support the University provides through tutoring, study skills workshops, and other services. "You can't fail unless you just want to," said Johnson, the Rutland High senior. "There's so much help here you almost can't take advantage of all of it." Schuyler, the MGA admissions office representative, makes herself available to dual-enrollment students and their parents seven days a week. She encourages the students to consider continuing on at Middle Georgia State after graduating high school. Many do, but Schuyler also takes pride in their success if they transfer to Georgia's highest-tiered research universities or elsewhere to complete bachelor's degrees. "MGA is recognized as outstanding feeder school by other universities," she said. "Our dual-enrollees who take four or more classes each semester are held to the exact same standards as any student at UGA or Georgia Tech. Our faculty are superb instructors and our courses are comparable to courses at those top-tier schools." Many dual-enrollment students end up being some of MGA's best recruiters, even if they themselves plan to transfer to other universities. "I'm committed to going out of town to college but I tell my friends they should consider Middle Georgia State if they are still thinking about where to go," Johnson said. "It's beautiful, the tuition is low, and the professors are awesome." Want to start college while still in high school? If you've never taken dual-enrollment courses at MGA before, contact Maggie Schuyler, assistant director of Admissions, at (478) 471-2725 or maggie.schuyler@mga.edu. If you're a continuing dual-enrollment student, contact Brian Warren, coordinator of Dual Enrollment at (478) 934-3177 or brian.warren@mga.edu. Warren is also the primary contact for students and parents specifically interested in Georgia Academy, MGA's residential program for dually enrolled students that is based on the Cochran Campus. See www.mga.edu/dual-enrollment or www.mga.edu/georgia-academy. This article originally appeared in the fall 2018 issue of MGA Today magazine.